So interesting to see the huge changes since being here four years ago. Gone are the open fields that were visible form the highway that connects the airport to the city, many new high rise buildings with many more under construction. We decided to visit the huge Sunday Market where there are hundreds of booths and thousands of people from many countries and walks of life. While Liz did research about some new design styles and made some new friends, Mark watched an endless stream of people walk past my sidewalk cafe table. The music was loud and heavy with a bass beat. As Chinese, Germans, Japanese, Americans, Thai – single people, couples, oblivious groups strolling past my table made it easy to people watch. The beer was cold and refreshing in the hot Bangkok air, watching the different expressions on peoples faces: smiling, frowning, curious, scowling was quite amusing. Some people even stopped to dance to the music and seemed to be truly enjoying themselves. 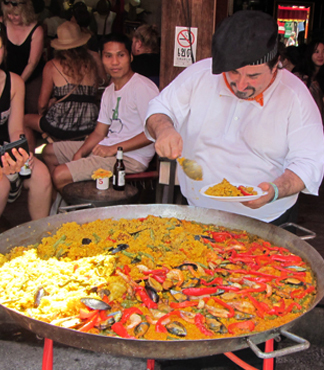 The cafe chef was festively cooking a large pan of rice, shrimp, chunks of chicken, spices and peppers. Marks waiter/waitress was what they call a girl boy here, getting weirder by the moment. Bangkok – is a melting pot of the diverse. Beautiful ancient structures, alongside aromatic seafood and produce markets, alongside massive traffic jams, smelly buses, daytime prostitution, abject poverty and modern high rises. Mark takes all of this in as he watches the crowds and then turns to see the chef dancing with the waiter. What a world we live in, so great to be able to share our experiences with you. Do you feel like you could be sitting there with Mark? He certainly paints a vivid picture of his day. 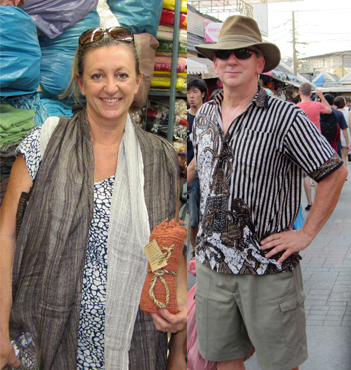 Stay tuned for more stories from Mark and Liz’s trip to South East Asia. We updated our blog design and features, check it out!